This will be one of the premier races in the area and boasts the only 5K and 8K runs held on a golf course! The setting for the race will be the Saginaw Valley Public Golf Course. Those who are ready to escape the "WEAKday" will enter a different world, as they run, walk, or scream their way through the course to their doom. Runners can enjoy the beautiful golf course, if they don't mind the occasional blood thirsty, brain eating virus spreading Zombies bent on getting a taste of unwary runners and slow them down! Proceeds from this exciting October screaming good time, and from other Rotary projects, have been earmarked to support the youth of Bay City! "The Rotary Club of Bay City has dedicated the proceeds of this event to the Bay Area Community Foundation and the City of Bay City to purchase playground equipment for the new Imagination Station that is scheduled to be constructed by May 2016" said organizer Wendy Dore. Running starts with the 8K race at 9:30 a.m. This is the first terrifying race of the twin race of the double Z and is followed at 11:00 a.m. by the 5K Run/Walk. "Run, walk or crawl in the 5k for the first race or compete in the second run for the Double Z. Racers in these 2 races will receive a free 'tech' T-Shirt to die for!" said Dore. The Freaky Fun run/Walk begins at 11:15 a.m. This event is great for the little terrors. Each child under 5 will get a free white t-shirt to decorate ?zombie style? with a bloody hand print, blood splatter, their name in red, or whatever color design they choose! 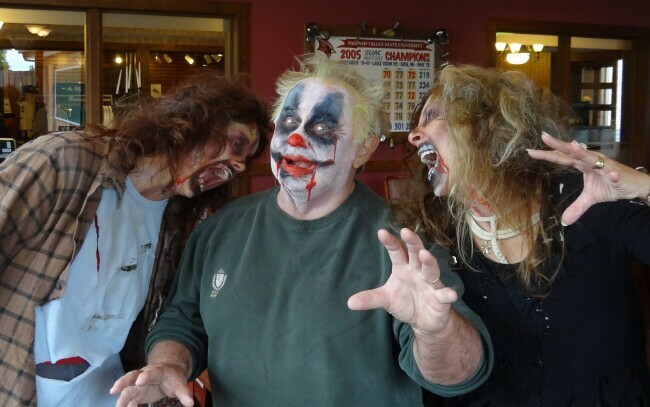 There will be free creepy activities, free medals for all participants, costume contests, awards ceremonies and the crowning of the Drop Dead Zombie Beauty. Makeup artists from the "Face The FX" makeup club will be on hand Saturday morning to transform runners who want a little added effect. "Face The FX" is sponsored by the Bay Arts Council and the Haunted Masonic Temple haunted house that runs each October. The opening night is Friday and the event continues Saturday night and each weekend until Halloween. The club is composed of local high school students who study makeup art throughout the year.